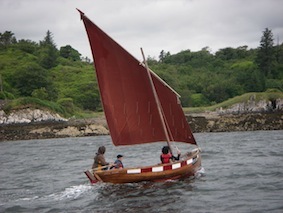 A Boat Retold - co-producer, with an Lanntair of a film by Sean Martin and Louise Milne, documenting the rebuilding of a 1912 boat, from the keel up. Featured in Tip of the Tongue Festival, Isle of Jura 2012, Ceol s Craic at Glasgow Film Festival, 2013, Alchemy film and moving image festival, 2014, Faclan, Stornoway 2014 and The Australian Wooden Boat Festival, 2015. The film combines HD video and Super 8 shot by Sean and Louise along with some of my archive stills and video of the old boat and the nearly-new one. Iain Louis Macleod planking the boat on the old keel. (shown as part of Cromarty Film Festival, Dec 2015) Ian was a guest. See under Andy Mackinnon and Uistfilm on Vimeo. The Sked Crew– from a Theatre Hebrides performance directed by Alison Peebles. Filmed with Neil MacConnell, Sail Loft 1, Stornoway, 2006.Included in a publication with DVDS linked to the heritage lottery funded Sail Loft project, managed by Mia Scott for (The Highland Buildings Preservation Trust). The Sked Crew - 15 minute drama commissioned by Theatre Hebrides, directed Alison Peebles 2006. Performed in theatres and in the open air, Isle of Lewis and Edinburgh. A development week to expand to a full-length play was funded by the National Theatre of Scotland 2007. Brazil 12 Scotland nil - a commission for Birds Of Paradise, directed by Morven Gregor, toured in 2005. Out Of The Jar - for Minatures, a Highland Festival touring production, 2004. 90 for 90 – a short meditation on The Shipping Forecast, broadcast on radio as part of the BBC's celebration of 90 years of broadcasting. The Norge and Rockall - contributor to Radio Scotland's documentaries 2012. Lewis to Lahore - ongoing collaborative performance developed for the Lahore Literary Festival and Edinburgh Book festival. Edinburgh international Storytelling Festival, Rathlin Sound, Settle Stories, Wordplay, Shetland. The Read Bed literary stage, collaborating with novelist and pianist Peter Urpeth and Scottish free jazz saxophonist Raymond MacDonald. (Belladrum Tartan Heart Festival, Aug 2009). Westlich der Zeit/Kilda Lyrics. Music by David P Graham, performed with choirs, soloists and dancer at the Rheinisches LandesMuseum, Bonn and Burgerhaus Stollwerck, Cologne, Oct 2007. 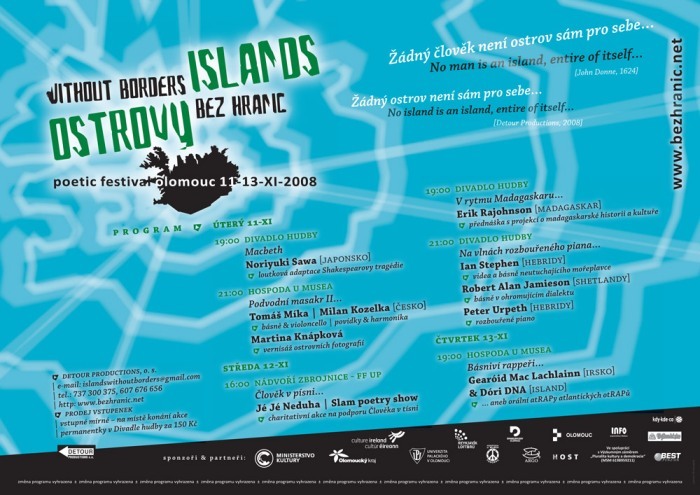 Writers from the Scottish Islands, 9th Salon Internationale du Livre Insulaire, Oessant, 2007. Five Fish, settings to music by David P Graham, performed Bonn, Germany, 2006. Snipe Shadows, samples on Hardland, Martyn Bennett, Martin Low, Cuillin Music, 2000. Lyrics from Malin, Hebrides… by Diethelm Zuckmantel, performed Dusseldorf, Germany, 1993.